Please keep in mind that these rates are for calls made between 9AM to 7PM and standard charges as per Account Package will apply during the rest of hours. Telenor Talkshawk Har Sec Package subcribres can even make 100% free calls from 10AM to 5PM on any Telenor number. Go to write option menu of your handset and write ‘7’ and send it to 555 (Re. 60 will be charged). If subscribers have enough credit i.e. Rs. 8.37, the amount will be deducted from the account and he/she will receive a confirmation message from the service. Your discounted hours depend upon the time when you activate your service. Follow the below given link to read the re-subscription process. 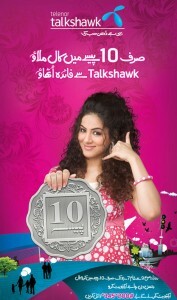 3 Responses to "Telenor Talkshawk Introduces 10 Paisa Offer"
That’s a good package. I love Telenor. I do’nt like ur telenor SiM. Plz to change your Pakages in your SIM. I HATE TELENOR.I HATE TELENOR.